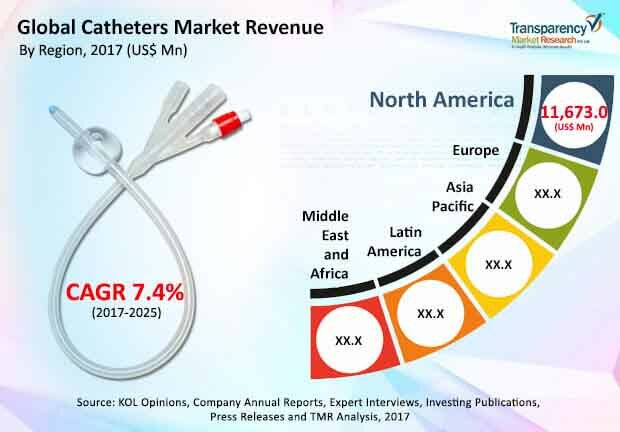 The global catheters market features a largely consolidated landscape characterized by the dominance of large conglomerate companies and global players, leaving little scope for small- and medium-sized players to secure a firm foothold in the market, finds Transparency Market Research (TMR). Notwithstanding the prominent forces of consolidation, the global market is, unarguably, intensely competition. Top players are required to focus on innovative product launches and are opting cutting-edge strategies to retain their prominence. TMR observes that a number of multinational medical device manufacturers are also harping on entering into collaborations and tapping lucrative avenues in various regional markets, in order to consolidate their positions. Key players holding a sizeable stake in the global market are Cook Group Incorporated, Teleflex Incorporated, Johnson & Johnson, Boston Scientific Corporation, C. R. Bard, Inc., Medtronic plc., B. Braun Melsungen AG, Becton, Dickinson and Company, and Abbott Laboratories. The global catheters market is projected to rise at a promising CAGR of 7.4% during the forecast period from 2017 to 2025. The opportunities in the global market is expected to reach a worth of US$55.98 billion by the end of this period. Broadly, the various product types are cardiovascular, intravenous, neurovascular, specialty, and urology catheters. Of these, cardiovascular catheters is the leading segment expected to collect large revenue over the assessment period. The growth is fueled by the rising prevalence of cardiovascular diseases, along with their growing mortality, affecting worldwide populations. Regionally, North America presently holds the sway by contributing the major share of the global revenue and is expected to retain its lead through 2025. This is attributed to the extensive uptake of various catheterization procedures in patients across the region. The widespread usage of vascular access and intravenous medical devices for the treatment of a wide variety of diseases and symptoms in worldwide populations is a key factor accentuating the catheters market. The notably rising demand for catheters in the area of urology, cardiology, and neurology, is propelling the growth of the market. The copious demand is also driven by the substantial application of urinary catheters by clinicians in delivering or removing medications and fluids to or from the patient body in order to manage bladder problems. The market is also benefiting from the rising demand for catheterization in managing urinary tract infections. The rapid rise in elderly population in developing and developed countries has led to a burgeoning patient population suffering with chronic diseases and urinary retention and incontinence. This is fortifying the demand for various types of catheters. Over the years, catheters have seen wide advancements both in the design and functionality. This is underpinning the rapid expansion of the global market. The growing affordability of catheters that help in non-invasive catheterization is a crucial trend providing a robust fillip to the growth of the market. The demand for catheters is also benefitting from the rising popularity of non-invasive treatments for cardiovascular and urinary diseases. The bold stride being taken by the healthcare infrastructure and services sector in developing economies is boosting the catheters market. The vast rise in disposal incomes in developing regions, coupled with rising awareness of catheterization, in various parts of the world is catalyzing the growth of the global market. A favorable healthcare reimbursement policies in several developing and developed countries is also helping the market to expand substantially over the forecast period. The widespread and rising demand for catheters in the area of urology, cardiology, and neurology is boosting the market. Technological advancements in medical devices will pave way for more lucrative avenues for manufacturers.